He stood at the window, clutching his brown fedora in his hands, admiring the "queen of the Tulsa skyline." Waite Phillips was proud of his creation. The Philtower was completed in 1927, and the building he now stood in, the Philcade, was completed just two years later. He felt as if he owned the city, and still, he was humble enough to know that if it weren’t for his elder brothers and the support of the community, he wouldn't be where he is today. Still, as with all wealthy businessmen of the day, Waite Phillips had to remain vigilant. The lawlessness that centered in Chicago during the 1920's and 30’s spread fear across the country, especially among many prominent and powerful citizens. Many millionaires began taking precautions, especially after the son of Charles Lindbergh was abducted in 1932. From this fear of crime and chaos in a distant part of the country, the Tulsa underground tunnels were born. 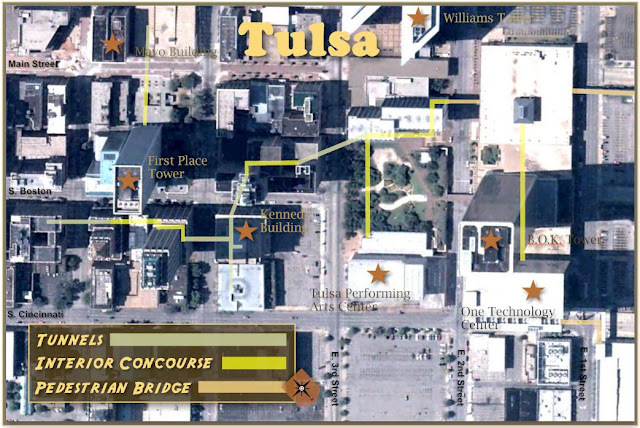 Map of the Tulsa Underground Tunnels as published on HubPages.